The Omar Apex situated on our paddock development has now been reduced to the fabulous price of £120,000. The Apex lodge changes the way lodges look with its classy hip roof front elevation and conservatory style lounge living. It is gracefully furnished with soft Belgium Chenille sofas and attractive Aqua Blue patterned Roman blinds to the full-length feature windows. The lounge, dining and kitchen area are semi open-plan with a cleverly created central feature wall which houses the TV and wall hung fire. Two velux roof lights above the dining room table allow light to flood in across the dining and kitchen area. Both bedrooms have double beds with the master bedroom having an en-suite with a large fully tiled walk-in shower. Both bathrooms come with designer wall hung basins and vanity units and stylish LED vanity mirror. This certainly is a stunning lodge to relax and unwind in. 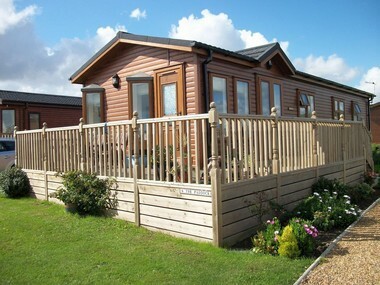 If you are wishing to purchase or upgrade into this superb lodge please pop in or call the office on 01263 823614. The lodge would be ready for you to enjoy the rest of the summer months in and don’t forget our lodges are open over Christmas and New Year.